Elizabeth Pearce contacted us because she wanted to share her story of how she became the first single woman to have IVF treatment on the NHS. Elizabeth, 39, had always wanted a child but unfortunately had never met the right man. It was only when she turned 38 and her biological clock started ticking that she realised she had to act soon if she was ever to fulfil her dream of having a baby. She decided to use a sperm donor and hoped the NHS would fund her treatment as she couldn’t afford to have it done privately, having recently been made redundant from her job. But Elizabeth was met with resistance from the outset, and her local Primary Care Trust repeatedly refused to fund her treatment, claiming she didn’t meet the criteria. 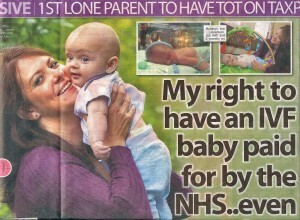 This was despite recent changes in the law which allow single women and lesbians to seek fertility treatment on the NHS. Elizabeth was determined to have a child and wouldn’t give up without a fight, claiming the decision was against her human rights. She believes IVF treatment should be available to everyone, regardless of their marital status. Elizabeth’s persistence paid off when the NHS finally agreed to fund her treatment, and in January this year she gave birth to a baby boy, Leo, who is now five months old. All she knows about Leo’s father, an anonymous sperm donor from the US, is that he is a mechanical engineering student with brown hair and green eyes. We secured Elizabeth an exclusive deal for her story with the News of the World, where she described the hurdles she had to overcome to have Leo. She says: ‘I truly believe single women have as much of a right to a child as couples do. In an ideal world Leo would have had a dad in his life, but that’s not the way things worked out. 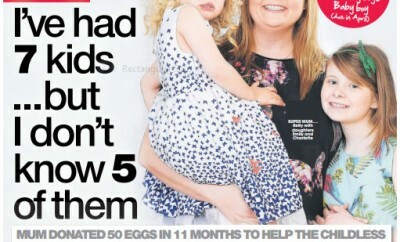 Fertility treatment should be available to everyone or not at all.’ Elizabeth’s incredible story is also due to appear in a women’s magazine. If you have an amazing real life story to sell, contact us at [email protected]. IVF egg donor helped other couples have five children!